Two months ago, I wrote a blog post arguing José Berrios should learn a cutter. My argument hinged on the striking similarities between Berrios and Corey Kluber and the fact that Kluber has a good cutter and Berrios does not. 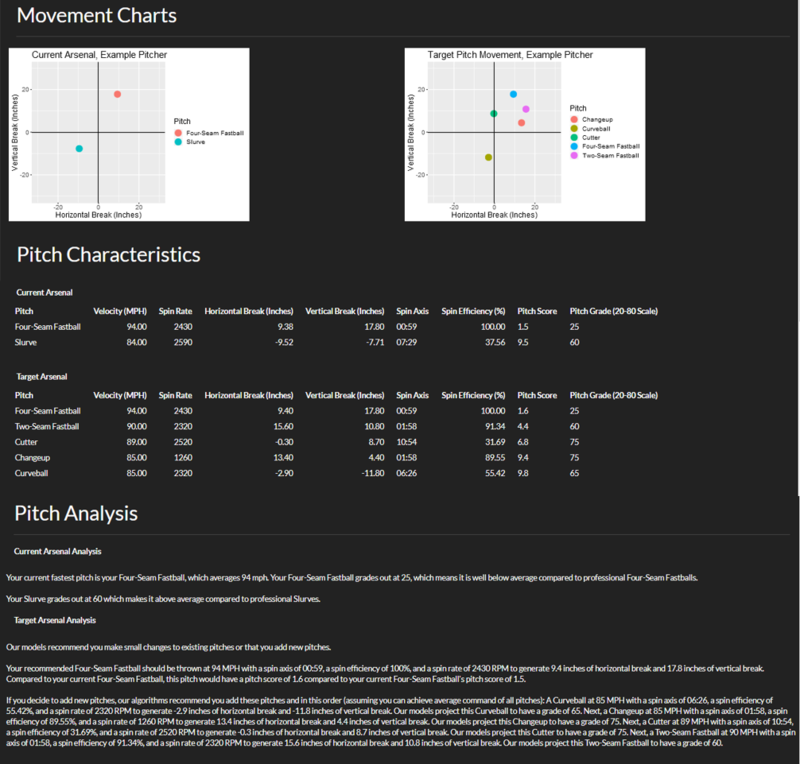 Since then, I’ve developed a more objective way to evaluate a pitcher’s current pitches and make recommendations to guide the pitch design process. Pitch design is the process of a pitcher making changes to existing pitches or adding new ones, often using high-speed video and devices such as Rapsodo or TrackMan to get the spin axis of the pitch just right to create desired movement. The app I’ve built creates targets for pitchers and details ideal pitch characteristics to give objective, quantitative direction to the pitch design process. Getting mad at an umpire, and then tossed from the game, may seem like an ineffective display of emotion since calls are never reversed after a little more yelling. But what about future calls? In order to answer this question, we need good data on a large number of adjudicated events. Close out and safe calls happen fairly rarely, and good data quantifying how close the play was would be difficult to collect. But the home plate umpire calls balls and strikes for every batter, and pitches at the edges of the zone provide plenty of opportunities to grow or shrink the zone slightly. It’s difficult to measure the zone in a particular game since there aren’t enough pitches at each spot on the boundary of the zone, but by combining data from many games, we can get a clear idea of what the average zone looks like. As for quantifying the zone, it’s easy to get carried away with details (location of each side, correcting for player height, etc. ), but with enough data, all of those variables should average out and we can focus on the simplest measure: zone size. During the past four years, there have been 308 games featuring an ejection over the strike zone, containing about 47,000 pitches. 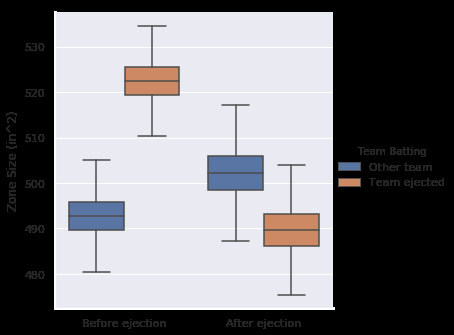 Splitting by team (team with ejected player/coach/manager and opposing team) and before/after the ejection, we have groups with between 9,500 and 14,000 pitches, plenty for a good estimate of the strike zone. The results, shown below, show two clear trends: first, one team is clearly justified in being upset as their hitters face a larger zone. Second, we see that umpires fix this, even over-correcting slightly, after making an ejection. We all see the humanity of umpires in their fallibility, but it shows in other ways too: the zone shrinks on 0-2 counts and expands on 3-0 ones, showing that they don’t like ending an at-bat with their own judgement call. This doesn’t mesh well with the fiery persona of the umpire and their emotive strike-three calls, but we have to remember that they are playing a part, and their main goal is to keep the game firmly in their control. We see more evidence of this here: if umpires ejected arguing players out of a sense of holy wrath, we would expect no change in the strike zone at all. Instead, we see a clear reaction in the direction that the arguing player desires. While the data cannot point to the exact mechanism, I see two distinct explanations: signaling and aversion to conflict. In the signaling hypothesis, we suggest that players are frequently sending messages to the umpire, but the umpire considers these messages according to the cost in sending it. A few words muttered under their breath doesn’t cost them anything, and so it is usually ignored. An ejection is costly, so the umpire takes that signal seriously. The second hypothesis is a simple human aversion to being yelled at in front of a crowd of thousands. It’s not a fun experience for anyone, so they take action to avoid it happening again. To measure the zone, I took two approaches, k-nearest neighbor (which knows nothing about the expected shape of the strike zone) and a logistic regression based model (which looks for a rounded rectangle). Error estimates were calculated using bootstrapped samples. Both gave similar results, and the code and data behind this post are available on Kaggle. Trevor Bauer is a walking headline. Whether he is turning himself into some kind of pitching robot in a lab or calling out his peers for using a foreign substance to enhance their spin rate, Bauer tends to attract plenty of attention away from the field. However, Bauer’s most noteworthy accomplishments lately have occurred on the field. Last season, Bauer had more fWAR than Blake Snell, winner of the American League Cy Young Award, despite pitching fewer innings and landing on the injured list for over a month. Bauer, unsatisfied with last year’s performance, developed his previously sparingly used changeup in the offseason to complement his already ample repertoire. Taking a look at Bauer’s pitch usage this year shows a clear difference in the way he attacks righties as opposed to lefties. Of course, the small sample size caveat applies at this point of the season, but Bauer has been featuring a changeup against lefties at a much higher rate than last season. Bauer now throws his changeup twice as often as last season against lefties, and so far the results have been good. The pitch has produced a 75% ground-ball rate when put in play, and opposing batters have only recorded a single hit off of it. 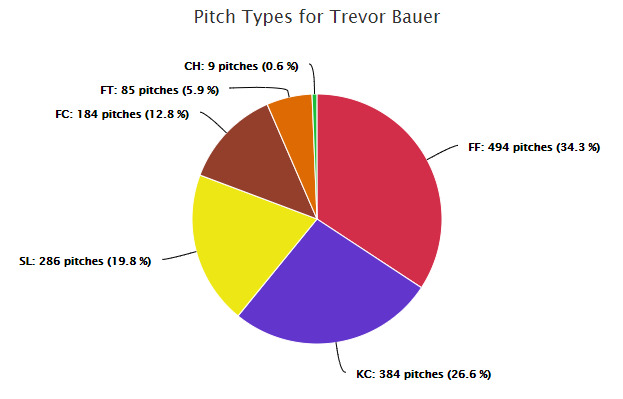 Comparing Bauer’s 2018 and 2019 pitch breakdown against righties reveals a few monumental adjustments. Bauer has evidently abandoned his signature knuckle curve and replaced it with a sharp increase in the usage of a cutter. In my opinion, these adjustments were made in the name of tunneling. Sliders and cutters both have primarily sideways movement, which makes it more difficult for the batter to differentiate between them. Curveballs and changeups both tend to break downwards, causing the same confusion for batters. 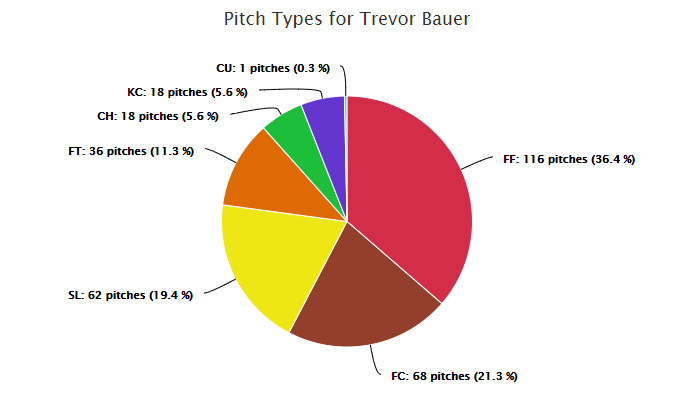 By pairing these pitches against righties and lefties respectively, Bauer decreases the chance that a batter can read the pitch correctly out of his hand. 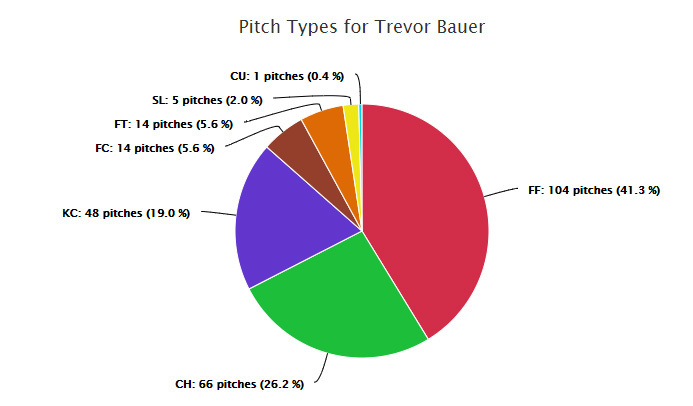 Up until this point, Bauer has been sharp, using his new changeup and dedication to tunneling to strike out a third of the batters he has faced and firing seven no-hit innings on April 4th against the Blue Jays. Through five starts, Bauer has struck out 32.6% of batters and at least seven in each outing. As Bauer continues to tweak his approach, perhaps he could benefit even further by lowering his fastball usage, mimicking the strategy of many pitchers before him, in order to combat hitters who sit on the pitch ready to unleash uppercut swings. By lowering his fastball usage and further utilizing his tunneling ability, Bauer will be even more unpredictable to hitters. Time will tell if Bauer’s new strategy will be successful all year, but based on his dedication to both analytics and his craft, he seems to be on pace for another Cy Young caliber season. Gabriel Billig is currently a student at Baruch College studying data analytics. Are Ted Williams’ Hitting Philosophies Still Relevant Based on the Data? In hindsight, it’s unfortunate that Ted Williams philosophies on hitting took so long to become universally accepted. His thoughts on batting were clearly ahead of his time and it has only been in the past few years that the more prevalent “swing down” views have largely exited the baseball community. In his book, The Science of Hitting, Williams suggested an upward swing path that aligns the bat path and pitch path for a better chance of contact – about 5 degrees for a fastball and 10-to-15 degrees for a curveball. This research note is not about the total amount of loft in the swing today — everyone knows that swing loft is greater now than in Williams’ day. However, there are some very interesting findings in the data in terms of whether players are utilizing consistent amounts of swing loft for different pitch locations, which is implied in Williams’ book. One observation that seems to hold in many sports is that the best performers are typically out in front of the popular views of the day in terms of changing mechanics for the better. However, as we will see in the data, this does not necessarily mean that these superior mechanics are being understood and directed by conscious understanding. There is evidence which suggests that VBA goes well beyond player “style” and is more of a core swing mechanic that is associated with higher quality contact as well as superior levels of performance. 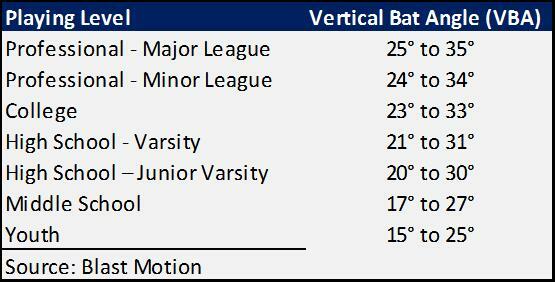 Here is a chart showing VBA by playing level. I believe that pitches aren’t thrown in a vacuum, and the effectiveness of one pitch is certainly affected by the pitches that preceded it. Thus, I wanted to identify the most- and least-potent 1-2 pitch combinations in the 2018 Major League Baseball season. 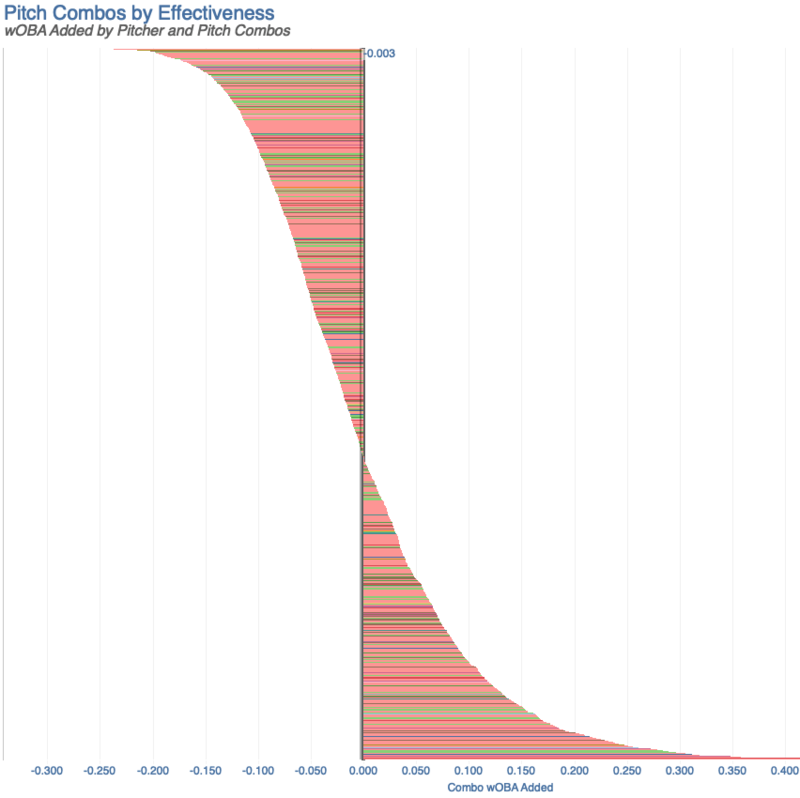 To accomplish this, I built a Pitch Combo Effectiveness Tool based on all 2018 pitches thrown in the major leagues. The approach I took was to evaluate every pitch as the second pitch in a 1-2 combo (forcing us to exclude first pitches in an at-bat). 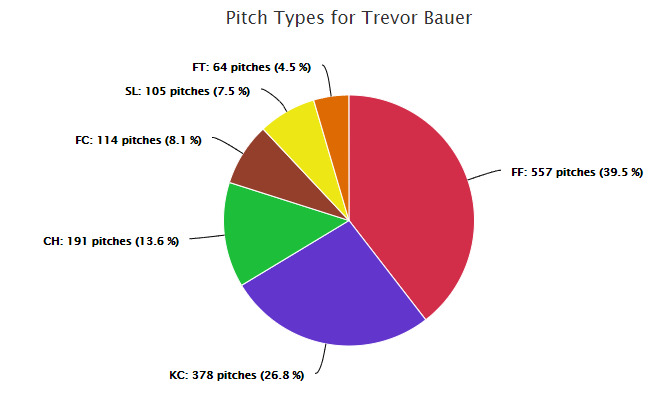 I defined these pitch combos using the pitcher, the pitch types of both the first and second pitches (e.g. “four-seam fastball followed by a curveball”), and the pitch location change from the first to the second pitch (e.g. “the second pitch was further down and more inside than the first pitch”). I then gauged the effectiveness or value of these pitch combinations using the sum of the wOBA added for both the first and second pitches. Lastly, to ensure we were only looking at common pitch combos, we filtered the results to pitch combos observed at least 10 times in 2018. As the 2019 season begins, Las Vegas determines the annual over/under win totals for all 30 major league teams and gives us a chance to examine intriguing over/under win lines for the upcoming season. Not surprisingly, the Miami Marlins found a spot right at the bottom of the list at over/under 63.5 wins. Will the Miami Marlins, under the ownership of Derek Jeter and the tutelage of Michael Hill, elude the worst record in baseball? Call me crazy, but there are a number of reasons why Vegas’ determination of 63.5 wins is undervaluing the Marlins.